The Norwegian capital boasts a wide range of attractions and museums for any taste, starting from authentic Viking Ships to exquisite works of world-renowned artists. To make your tours to Norway even more unforgettable, check out the best Oslo museums. Being one of the most popular Viking museums in Oslo, the Viking Ship Museum boasts best-preserved 9th century wooden Viking ships, which were discovered, excavated and brought from different parts of the country. Amazingly, the ships are practically intact! As such, the Oseberg ship was found practically whole. Other attractions that are of high interest are archaeological finds from Viking tombs: a number of smaller boats, tools, household objects, beds, tents and sledges. The Kon-Tiki is among the most visited ship museums in Oslo, holding the one and only collection in honor of the explorer Thor Heyerdahl. In 1947 he set off on an exploration on the balsa wood raft called Kon-Tiki, on which he crossed the Pacific Ocean and sailed from Peru to Polynesia. The museum offers guests a breathtaking exhibition with original vessels, including the Kon-Tiki itself, as well as an opportunity to go on a 30 m. cave tour. Visit the Kon-Tiki to find out more about Heyerdahl’s expeditions with an exclusive sneak peak in the discoverer’s library, made up of about 8 thousand books. Those who are interested in local culture shouldn’t miss out on the Norwegian Museum of Cultural History. It is the first open-air museum in the world and one of the largest in Europe of its kind. Made up by over 150 genuine Norwegian buildings of different time periods and regions of the country, it encompasses numerous artifacts, traditional handicrafts, costumes and much information on the local Sami culture. Yet the main exhibit of the Folk Museum in Oslo is the unique Gol Stave Church that dates back to the year 1216. This wooden beauty was saved from demolition and transferred to the territory of the museum for historic legacy protection. Dedicated to one of the most famous expressionists in the world, the Munch Museum obtains the broadest existing collection of Edvard Munch’s works of art. In the halls of the museum visitors will find approximately 4,500 of his drawings, around 18 thousand prints, and about 1,100 inspiring paintings that transfer emotions by his distinctive brush stroke techniques and color palettes, including the 1910 The Scream. Munch created 4 versions of this incredible and recognizable painting, and the 1895 pastel is among the most expensive works of art ever sold on an auction in history. The National Gallery is among the key art museums in Oslo that holds one of the broadest public collections of art in Norway. Art admirers can enjoy paintings by El Greco, Vincent van Gogh's "Self-portrait", Claude Monet's "Rainy Day" and paintings by Cézanne, Manet, and Pablo Picasso. As for Norwegian art, works by Edvard Munch (such as the most famous canvas of "The Scream"), as well as paintings by Adolph Tidemand, Hans Gude, Harriet Backer, and Lars Jorde are honored treasures of the National Gallery. The permanent exhibition - The Collection from Antiquity to 1950 - is also worthy of notice. 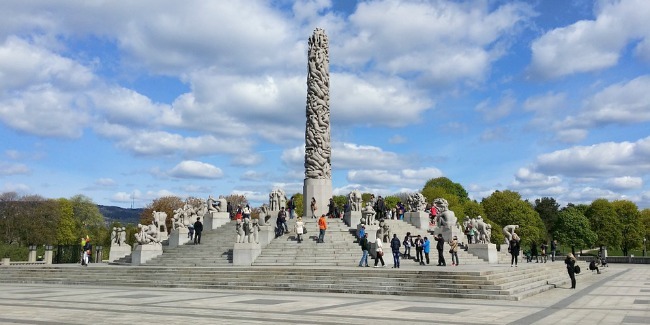 As for admirers of sculpture, the unique Vigeland Museum is a true highlight. Set in a neo-classical 1930 building, it is an intrinsic part of the famous Frogner Park and the Vigeland Sculpture Park (one of Norway’s most visited attractions). The exhibition halls of this museum, which was once the home and studio of the renowned sculptor Gustav Vigeland, hold his incredible artwork. Visitors are sure to enjoy his early works and portraits, as well as the models of the sculptures that are displayed in the park, and to learn interesting facts about the toilsome process of their creation. Also known as the Holmenkollen Ski Museum & Tower, the Ski Jump Museum in Oslo is a key landmark embodying the art of skiing. The museum was opened in 1923 and encompasses an all-embracing exhibition telling about the 4000-year-old history of this winter sport. From ancient artifacts and prehistoric skis to ski equipment from polar expeditions to modern snowboarding and skiing attributes the Ski Museum is great fun. What is more, the incredible open deck located atop the jump tower is an absolute must-visit as it opens great views of the city. The Fram Polar Ship Museum in Oslo was built to honor the immense achievements made during the Polar explorations of Norwegian discoverers. The main gem of the exhibition is the Fram ship. It is the original vessel that was used by the group - led by Fridtjof Nansen, Otto Sverdrup and Roald Amundsen - to explore the Arctic and Antarctica between 1893 and 1912. This unique wooden ship is still a record-breaker for sailing farthest north and south in the world. Museum guests can step aboard the ship to get a close-up of its amenities. Moreover, an exclusive simulator gives a chance to get an insight on how the explorers survived in the harsh Polar living conditions. The Norwegian capital is wealthy in many ways: it boasts breathtaking nature and unique architecture, and when it comes to Oslo museums, they are an absolutely unmissable, entertaining and informative experience that will surely illuminate any Norway tour.